I have a Tappen Deluxe model no. TV-6219 and am trying to restore it. It works perfectly fine but I am in need of several parts and am wondering if any of you guys have websites that you use to shop for parts. I need the burner covers and a few other things. Looking for any info on a Tappan stove model BGVD-57. It has horizontal vents on each side of the back-splash, a pull-chain light with clock. 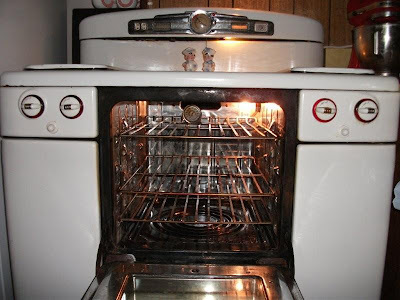 Oven is chrome with a window. It does not say Deluxe, only Tappan. It does have a timer on one side of the clock and cooking directions for different meals on the other side of the clock. 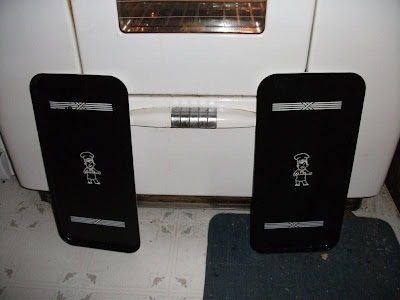 The burner grates are 2 large rectangle ones instead of 4 square ones. 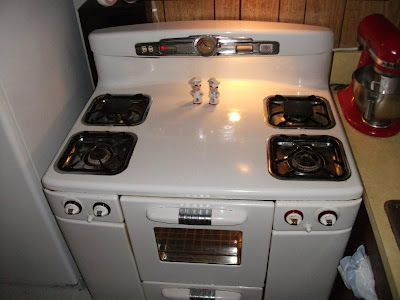 I have searched all over and can't find a picture of this stove anywhere. I am picking this stove up this evening so can take a pic then. Anonymous - See the link on the left side of the blog for parts. Thanks for the inspirational pics. I just got home from cleaning out my late grandmothers house. 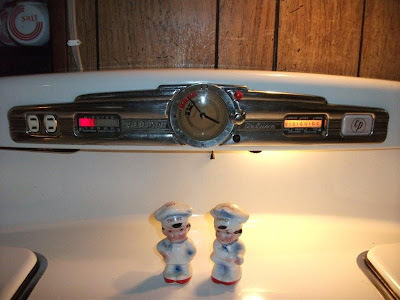 I was hesitant in taking her Tappan stove because of lack of room in my garage. Well I'm glad I decided to take it. I was doing research and came across your site. I am now inspired to restore it to its glory. We just bought a fixer up house and it the house was a Philgas Tappen Model# 1746 Serial # 176-373. I am thinking the year is around 1952-1954? 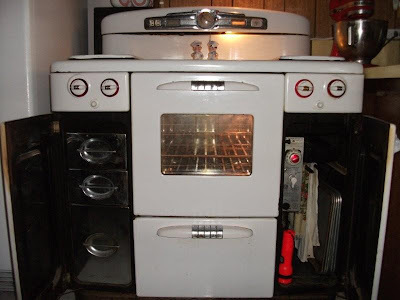 Can someone help me with information on this stove? The early Tapan Philgas model numbers tell the age. A 1746 would have been a high end model from 1946. If you have photos you can email, I might be able to tell you more. I have my grandmother's Tappen Deluxe. It has worked since the 50s. Recently the gas company discovered two small gas leaks. One in the left front burner and the other in the oven. I didn't smell any gas. 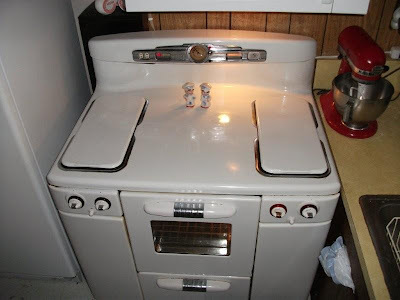 The man from the gas company told me to get a new stove because this one is so old. I would rather have this one repaired. However, I have no idea how to find someone who is familiar with working with old stoves. Can anyone help me find someone in the Philadelphia area? Hi there, I have a mystery stove. I've looked all over the web and can only find 1 similar. 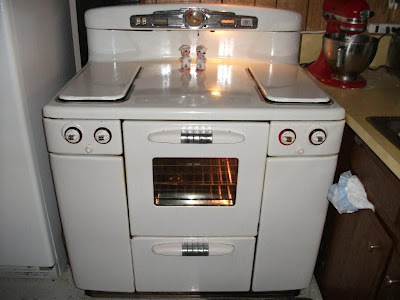 The knobs and the oven handles are the same shape as the stove on this post and I'm wondering if it might be a Tappan. It has a crest on the front left door for Montgomery Ward, but I know they didn't actually make stoves just resold them under their name. I have a query up on the gardenweb website where a pic is posted. WhoooHooo!!! I just found the info I needed! Thanks! I just got this very model at a farm sale for 5 bucks! BRAND NEW> literally. The husband had bought is as an 'additional' stove for his wife to can on. They NEVER hooked it up. Everything is complete..even still has the little glass squares for the center of the burners. Now to make sure it works... Thank you for being here! Just got a 1948 tappan deluxe last night in near mint condition. There is no rust no dents and no dings and it works perfectly. However it is missing a few things like the burner covers and the racks for the side area anyone know where I can purchase parts for it ? I've been restoring my grandmothers. I have found a couple things on ebay but just wound up buying a pretty pristine Tappan off ebay to "part out". It was cheaper than piece by piece in my opinion.